I always feel like I'm celebrating St. Patrick's Day when I wear this dress; it's the perfect color green for any Irish themed celebration. Truthfully, I don't have a drop of Irish blood, but some of my favorite people in the world are Irish. The dress is available to rent from Rent the Runway in this beautiful Kelly Green, and you can still buy it on Amazon in that hot Trina Turk "pink swizzle" color. I'm excited to watch one of my favorite fashion events tonight: The Emmy Awards! I will be watching to see what the crew from Orange is the New Black wears since they normally have to dress in prison garb. I'm sure they are taking advantage of every opportunity to dress up and glam out. What do you think of using blue to complement the orange? I've never tried these two colors together before. You just can't go wrong in a fit and flare dress, and the inverted pleat on the skirt adds a little something extra. But I think I especially love this dress from designer Cynthia Steffe for its playful metallic print. It works for any skin tone! Although you could wear just about any color shoes with this dress, I chose these BCBGMaxAzria metallic pumps for a head to toe metallic look. The shoes were a gift from my sister-in-law, Stacey, for my 35th birthday, so they are especially special to me. The shoes are no longer available, but here is a similar style. I added red lips, ruby earrings and a cherry red Kate Spade New York purse for a little pop of color. I love having a palette like this one to work with, because you can really play with your accessories. I'm excited for the weekend, mainly so I can catch up on all the sleep I missed this week. Happy Friday! Chapin was home this morning to take this photo on our patio, and he always does such a nice job. I like how the blue in my eyes is popping, making you almost miss the extremely dark circles underneath. I've definitely been working too much and not getting enough sleep this week. We've been having some freak weather in Atlanta the last few days... temperatures in the 80s and low humidity. It's a summer miracle! Comedian and actress Michaela Watkins wore the dress on The Soup. It's been a sad week for celebrity deaths with the passing of Robin Williams closely followed by the death of Hollywood legend Lauren Bacall. The death of Mr. Williams particularly jarred me because he played such a large role in my childhood, from Mork & Mindy to Dead Poets Society to Hook. If death teaches us anything, it's to live and enjoy every moment. I know I need to do a better job of relishing in the good each day brings me... a kiss from Chapin, a sweet look from George, a call from my Mom, a text from one of my sisters. These are all good things, and I am thankful for them. If I'm working a 12-hour day, or cursing my alarm for waking me up at 4:45 a.m., I at least know I am truly loved, and I love in return. That is what life is about, isn't it? Amazon has the Nanette Lepore First Love Jacquard Sheath Dress in a different color combination (black/white), and NanetteLepore.com is also selling the Hot Pursuit dress in all black for under $100! Hurry before sizes run out. What a great deal. I'm excited for Book Club today. The topic of discussion: Big Little Lies, by Liane Moriarty. I really enjoyed it and highly recommend it. I'm in head to toe Kate Spade New York today, a great way to start off the week. I have seen this dress on many other fashion blogs, and it's always interesting to see how other women style what is essentially a simple striped dress. I added a navy bow belt to mine (also Kate Spade), blue handbag, and neutral grey shoes. The dress is hard to find online, but you can rent it. The wedges are still available on 6pm.com in black and camel. They are super cute and comfortable, too. This particular color is generally sold out online (I originally got it more than two years ago), but you can still buy it in different styles on eBay. The Kate Spade New York Cedar Street Maise bag in Emperor Blue is very similar, and available now at KateSpade.com. This dress was seen in a season three episode of Scandal, and E! News Anchor Giuliana Rancic wore the dress in a recent TV commercial for Ashley Furniture. I couldn't help but think of this quotation from one of my favorite holiday movies as I got dressed this morning. This purple Nanette Lepore dress is super flattering. I just love a good fit and flare dress, don't you? Saks still has the dress in purple in a few sizes, and several other retailers are selling it in other colors. Bluefly.com has the dress in blue, black and ivory. Check out a similar style on Amazon. 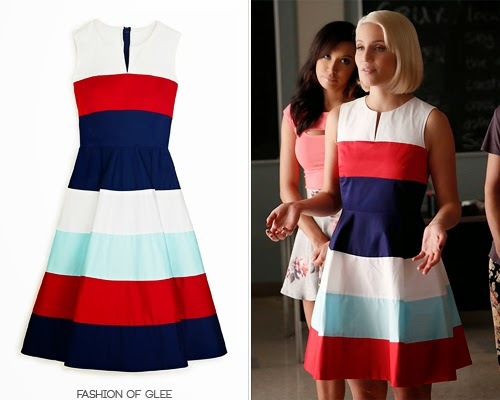 Margaux (Karine Vanasse) wore this dress on season three of Revenge. Summer may be winding down, and Atlanta schools are already back in session, but it's still extremely hot in the city today. I'm wearing hot pink neon in full appreciation of this sweltering day. I'm not normally a huge fan of shift dresses - they tend to work best on women who are small and less curvy - but I couldn't resist the combination of tweed and neon pink from my favorite designer. The dress is generally sold out, but check out this similar style from Shoshanna on Saks.com. This lip color is very light, but it's the perfect complement to the pink dress. I also have to mention that I am wearing the earrings my littlest sister, Laura, gave me when I was in her wedding five years ago. I still can't believe my baby sister is a married mom of two! 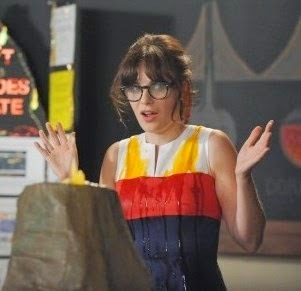 Ali Fedowsky is a fan of Shoshanna and was recently seen in the Shoshanna Penelope Tweed Dress. I went a little more casual with today's dress, mostly due to the fact that I have a rare day with no (in-person) client meetings. I think the pattern on the dress looks like stained glass up close, but it's essentially a paisley lace pattern. I love Shoshanna dresses not just for their flattering cuts, but for their uniqueness as well. I love Alexis Russell's simple yet elegant designs, and I hope to get more of her jewelry over time. They key necklace is one of my favorites. These sandals are no longer available, but here is a similar style on 6pm. I love how this deep plum lipstick highlights the wine berry color of the dress. George was very excited about today's picture, and especially likes my shoes. He is 9.5 years old and my baby!